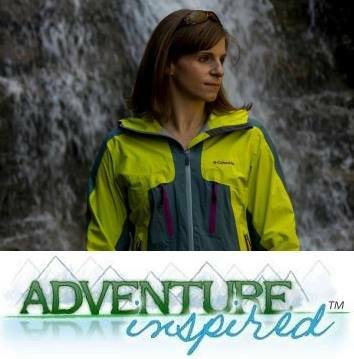 When my partner in crime and I started planning our trip to the Canadian Rockies, I knew I was going to have a tough time picking trails for the days we'd allotted for hiking. Banff National Park alone is home to 1600km (1000mi) of maintained trails! Of course, not all were options for us in winter, which helped us narrow things down. Johnston Creek is a tributary of the Bow River, originating from a glacial valley to the northwest. As the creek flows closer to the Bow River, it flows through a deep canyon formed by years upon years of erosion. 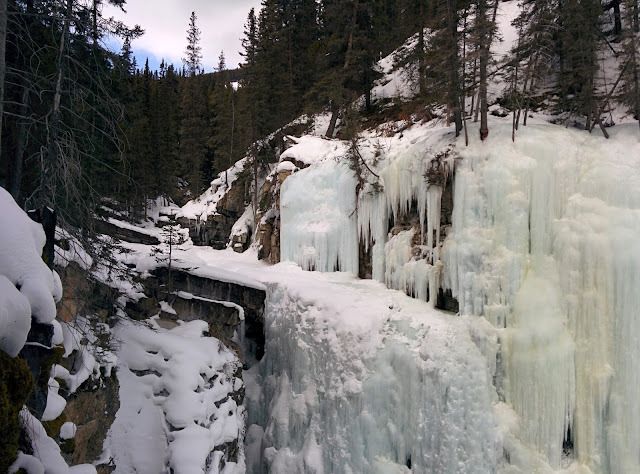 Parks Canada calls the canyon "one of the most spectacular natural features in Banff National Park," and the Banff town website mentioned "the trail to the waterfalls of Johnston Canyon has to be the busiest in the Canadian Rockies." We went anyway, figuring it couldn't be that crowded on a mid-week day in the middle of the winter. The trailhead is an easy 30 minute drive from Banff, following the Trans-Canada Highway (west to the Bow Valley Parkway (AB-1A). The parking lot was quite full by the time we arrived around 11am, and despite the fact that it had clearly been plowed all season, it was completely covered in ice. I was immediately thankful we'd packed our Yaktrax. After we parked, it was impossible to miss the trailhead; a giant wooden sign reading, "Johnston Canyon" stood towering above the trail. With our Yaktrax on, we started up the wide, snow-covered trail. We passed a handful of small cabins, part of the Johnston Canyon Resort, and soon arrived at the beginning of a series of catwalks after dropping out of the forest. Wandering through the canyon, thankful for the catwalks and railings! The sturdy iron catwalks are build right into the side walls of the canyon, and give hikers a chance to tour the bottom of the canyon rather than restricting walking to above the rim. It was incredible to be that close to the water with steep ice-covered canyon walls all around us. 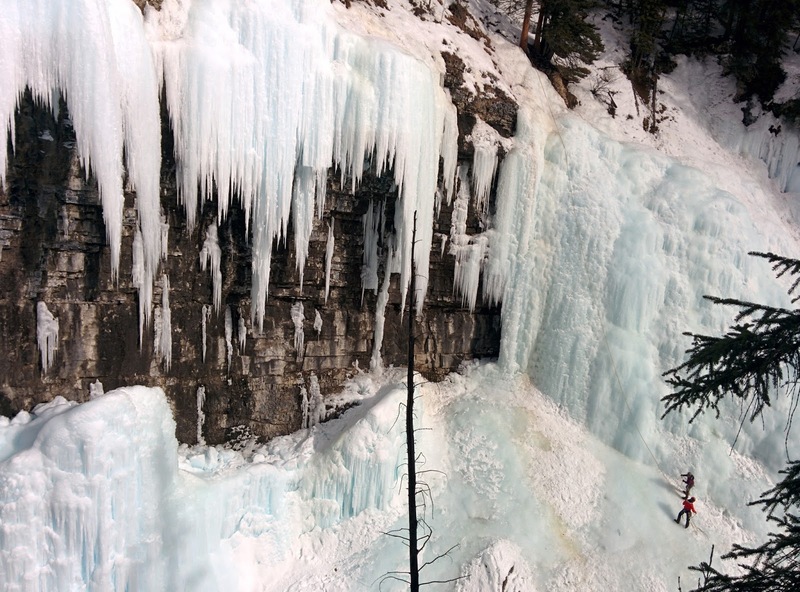 Ice climbers near the Upper Falls. The Upper Falls are just out of sight to the right of the frame. It was an easy, enjoyable 1.2km (3/4mi) hike up to the Lower Falls. Where we didn't see snow and ice cascading down from above, we saw gray and brown rock covered in ice crystals, or small perches just big enough to accommodate a tree or two. The creek rushed past us, sometimes invisible under ice, and other times, the deep blue water was tough to miss. A bridge extended the trail across the creek and into a small cave right across from the Lower Falls. We found the cave crowded, and didn't spend much time there. The top of the Upper Falls from the viewing platform. We continued on another 1.2km (3/4mi) along the catwalks to the 30m (98ft) Upper Falls. Hikers can access the bottom of the falls via a side trail and catwalk, which leads to a viewing platform. When we arrived there, we saw a pair of ice climbers, which I learned was the norm for that time of year. We backtracked to the main trail and headed up a short, steep climb to the top of the falls and another viewing platform, but didn't stay long. Many hikers turn around at the Upper Falls, but we opted to continue on to the Ink Pots. As soon as we passed the Upper Falls, the crowds disappeared, and save a handful of people, we had the trail to ourselves. The main trail climbed up above the falls, out of earshot of the creek, and through a forest of towering trees. Partway up, we came to a junction with trails from Moose Meadows and considered taking them down to avoid the crowds, but learned they didn't end up in the same place we started from. Staring down into the creek just above the Upper Falls on our way to the Ink Pots. The trail wound up, down, and around in the forest, but eventually, we noticed the forest starting to clear. After crossing a completely ice-cover patch of trail, a giant meadow and the Ink Pots came into view. We walked around the Ink Pots, swirling, bubbling greenish pools fed by an unknown source of spring water at a constant temperature of ~4ºC. We sat mesmerized, watching dark brown and black sand bubbling up through the water. Exploring the trails around the Ink Pots. The area sees a significant amount of visitation in the high season, but we were just about alone! To the east, we saw Mystic Peak and Mt. Ishbel, and straight ahead, the rest of the Sawback Range dominated the landscape. We ventured past the Ink Pots and into the meadow, finding a giant bridge, and explored until we were ready to turn around and head back. Round trip, the hike took us around four hours. Check the trail conditions before you go to make sure you've got the right gear and clothing. Be prepared for significant crowds, even in the off-season. We chose a chilly Tuesday for our hike, and we found a mostly full parking lot at 11am. I can't begin to imagine what the parking lot looks like in the summer. And the pathways along the canyon are narrow; we had to stop behind groups more than once until we got past the Upper Falls and started toward the Ink Pots. Take Yaktrax or some sort of traction devices with you if you're hiking in the winter. The pathways in the canyon resembled long, choppy skating rinks. Though there are railings, we saw so many people without traction devices slipping, or holding on to the railings for dear life. If you don't want to deal with crowds, but still want to see the Ink Pots, you have options. The route via Moose Meadows, 1.4km west of Johnston Canyon, bypasses the Johnston Canyon trails, but still gets you to the Ink Pots in 5.9km. 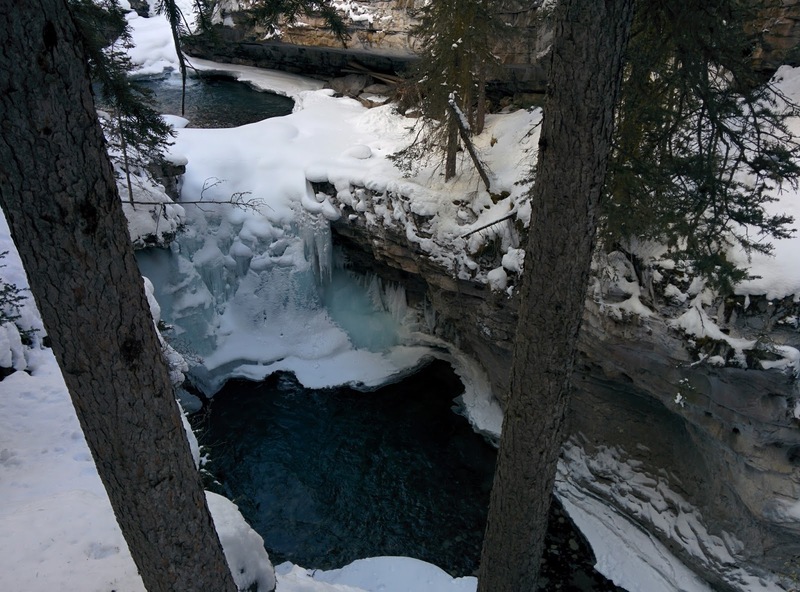 Have you been to Johnston Canyon and/or the Ink Pots? I'd love to hear what your experience was like, especially if you went in a different season!